Should I presoak raw denim jeans? Williamsburg Garment Company jeans are sanforized; meaning the denim used is pre-shrunk and will only shrink slightly during the first wash. Therefore, presoaking raw denim jeans is a personal preference. Some wearers buy jeans big in order to shrink them to size by presoaking. Presoaking also removes some of the starch in the finish of the denim and reduces crocking. Others buy their jeans a little tight or to fit, avoiding presoaking because the jeans will stretch and soften through wear, eventually shrinking down after the first wash. For more information on the subject, check out our sections on sanforized vs. unsanforized denim and shrinkage. 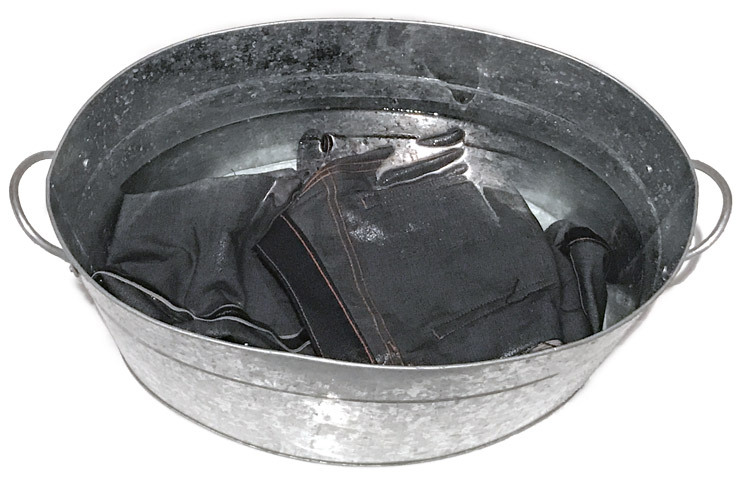 We recommend soaking jeans in cold water, never hot or warm. There’s a reason most care labels of dark colored clothing tell you to wash in cold water. It’s because colors are dyed in hot water and hot water will only release the dyes. Although with denim, you will lose indigo with each wash or rinse, cold water will decrease the rate of loss as compared to hot water. For more information the subject, check our Frequently Asked Questions page entitled How do I clean raw denim jeans?